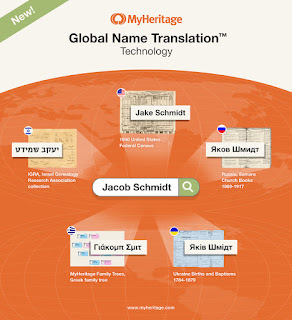 MyHeritage has just announced a ground breaking technology to assist in foreign language translation when doing genealogy research. This exciting new advancement automatically and accurately translates names across records in 17 different languages with more languages to come. MyHeritage has played to their strengths in this beneficial innovation and is using their global reach in advancing the language capabilities available for family history research world wide. We are happy to see the successful growth of MyHeritage. They have partnered with us as their exclusive chart printer and this summer we have especially experienced exponential growth as they continue to expand world wide. We have printed their charts in many languages including Russian, Hebrew, Italian, Polish, Czech and Spanish and have shipped all over the world for MyHeritage including such exotic locales as Nepal, Saudi Arabia, Norway, Turkey, New Caledonia, and Ghana. We are grateful for their partnership and look forward to their continued success.